For help after this pane is closed, view the pictorial guide and other information by clicking the ?help icon in the upper right corner of the map! Detailed information on the data and methodologies included in the application is available in the technical report. The mapping application allows you to drag-and-drop your own local GIS data onto the map via the Ogre web (client) service. The supported formats that can be dropped onto the map are GPX, GeoJSON, IGC, KML, and TopoJSON data. Although shapefiles (SHPs) are not natively supported, the service here will convert your shapefile to geoJSON so that it might be added to the application. Your shapefile will be converted to GeoJson format; a new window will open where you can see the file and save it to your device (do not change the file extension). Once you've saved the GeoJson file you can drag and drop it onto the map to visualize your layer along with the other application data. Our geographic database of critical infrastructure includes a variety of structures at risk from flood events. 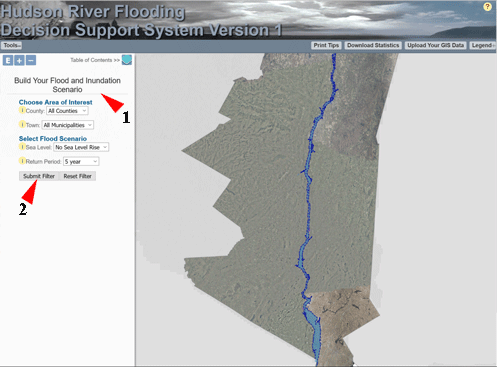 This tab presents a summary of the number of structures in each of these data layers that fall within the flood zone for each flood scenario. 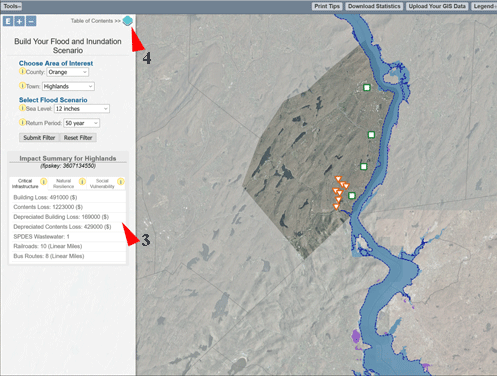 Here descriptive statistics of several spatial data sets for natural features are summarized at the municipal level and in the area estimated to be impacted by the selected flood scenario. Large, intact forests, wetlands, and floodplains and those that provide connectivity between natural areas are most likely to maintain natural processes contributing to resilience and will facilitate the migration of plants and animals as climate changes. Used together with the ecology and infrastructure layers, these results allow you to analyze spatial patterns and to locate areas of particular vulnerability as well as natural areas of greatest importance to slow and store water during a flood. The New York State Department of Environmental Conservation (NYSDEC) Climate Smart Communities Certification Manual outlines a variety of municipal flood adaptation strategies. See Pledge Element 7 of the Manual for more information. For a brief summary of the resilience values of these natural features and associated flood adaptation strategies, please see the accompanying technical report. To access the full suite of result data, please use the Download Statistics link in the upper right corner of the application. The Social Vulnerability Index (SoVI) was developed to map populations at risk from predicted flood events. SoVI is a multidimensional measure that helps identify areas with a high likelihood of sustaining losses, or an insufficient capacity for resilience from flood hazards. The index is derived from a statistical analysis of common dimensions of vulnerability such as social characteristics, economic status, isolation, and health. SoVI can be used to compare vulnerability among block groups within and outside of a municipality to identify areas where additional outreach, assistance, or tailored policies may be needed to address flood vulnerability. The impact summary table includes the decile rankings of block groups in the municipality that are potentially impacted by the flood scenario. The summarized variables are the 5 principal components that constitute the index, the index itself for impacted block groups, and the index value for the municipality as a whole. Comparing the values for impacted block groups to the entire municipality can help to determine if flood prone areas are more or less socially vulnerable than the municipality as a whole. The principal components provide information about the particular aspects of vulnerability present in impacted blocks. Used together with the Social Vulnerability map layers in the Table of Contents, the SoVI results allow you to compare vulnerability among block groups within and outside of your own municipality, and to compare the municipality as a whole against other municipalities. For a full explanation of the assessment of critical infrastructure, please see the accompanying technical report. To access detailed methodology on the calculations that were used in the creation of the index and the full suite of input and result data, please use the download statistics link in the upper right corner of the application. To read more about the theoretical basis of social vulnerability to hazards, see Cutter et al. 2003 (http://onlinelibrary.wiley.com/doi/10.1111/1540-6237.8402002/epdf). A flood event return period (P) represents the expected average time between events. In the dropdown, the lower numbers refer to low-intensity, more common flood events; the higher numbers refer to high-intensity, less common flood events. Although return periods always include some reference to time period (e.g., a 100-year storm) that is not meant to imply that such an event will only occur every 100 years; rather, that it is a rare event, with only a 1/100 (or 1 percent) probability of occurring each year. Despite the low probability, 100-year events have been known to occur twice in one year, or in back-to-back years. Cases with 'No Storm' show daily high tide water levels for the selected sea level and with mean river streamflows. Please refer to the technical report for detailed information. Albany, Columbia, Dutchess, Greene, Orange, Putnam, Rensselaer, Rockland, Ulster, and Westchester. 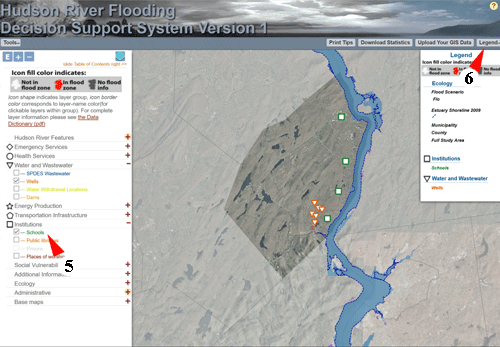 Floods are mapped only in the Hudson River floodplain, so areas of flooding from other watersheds or from direct rainfall runoff are not included in the mapping. There are 53 municipalities in the study region which could be potentially impacted by Hudson River flooding. 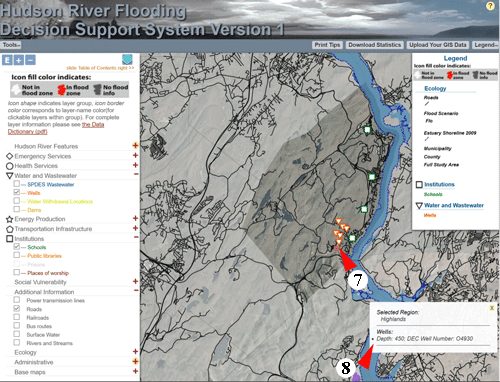 Floods are mapped only in the Hudson River floodplain, so areas of flooding from other watersheds or from direct rainfall runoff are not included in the mapping. The array of sea level rise scenarios available in the mapper ranges from relatively low to high, from 6 to 72 inch increase in sea level. It is important to remember that these scenarios are estimates and the time horizon for when they might occur is not certain. Please refer to the technical report for detailed information. Scenarios denoted with an * have corresponding time series animations available.